Join the astonished patients with Heayoon right after the first treatment. 3 years old male patient suffering from severe constipation and stomach pain came to us. He needed Miralax everyday, and even with very close caution, some type of food triggered his stomach pain, but the parents couldn't figure out what exactly is the allergens. Heayoon Park used BioVeda allergy laser to find out what kind of materials were creating the stress on him, and used none needle technique acupuncture to treat his condition. The young patient tolerate the treatment with ease and enjoyed sessions with Heayoon Park. On the 3rd visit, he and his mother started to report visible improvement on his symptoms and gradual but perceivable change in his bowel movement. After 5 month, he now enjoys bowel movement at least 5 times a week, and food sensitivity is negligible. Young babies should go through huge changes in their first 3 years from breathing to digestion, sweating, and emotional relief. Asian medicine can help them to break into the early life. 46 years old female patient who suffered through her whole life from various allergies. Her skin were itchy and swollen from allergy, and she needed inhalers everyday to prevent a serious attack of asthma. Heayoon Park used BioVeda Allergy machine to figure out the possible candidates of allergen, and used both of the same device and gentle acupuncture to treat her symptoms. She was astonished with the result after the very 1st treatment, but for the stable results through seasons, she stayed with her treatment for a half year, and finally released. 52 years old male patient who had a stroke in age of 13 and paralyzed on his left body came to us. Consistent effort for the past 40 years improved his motions 90%, but his leg and hand consistently contracted to painful level. His past physician injected Botox into his affected muscles, but the patient didn't agree with the idea to cut the nervous control of his already paralyzed muscles. 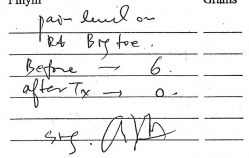 His left hand and foot got relaxed over 80% on the first visit, and his strength of the leg improved gradually. His foot drop also visibly improved. On the long hall way in Denver international airport doesn't catch his foot anymore. If you are a stroke patient who are disappointed with the current plateau of recovery, please give a try to our approach. Fibromyalgia can be confused with many forms of pain. When you have pain all over the body including fibromyalgic points, then you'll be diagnosed with FB, though still you maynot have it. We have a few fibromyalgia patients who improved in fatigue, pain, and close connection of physical conditions to emotion. Their sensory nervous systems are overexcited, still general body strength is debilatating level. Overexcited nerves trigger pain in any types of musculature, i.e. the gall bladder. Quite often, FB patients come to us to treat other common problems-shoulder injuries, depression, insomnia etc., then report good progress in FB pains and fatigue. One lady in early 50s wanted us to treat her frozen shoulder. After a good improvement on the range of motion and pain level on the first visit, she agreed with us on the need of a few maintenance visit further. It took 2 weeks for her to come up with a great side-benefit, great improvement on her fibromyalgic pain! It is an auto-immune disease killing thyroid cells and make a patient extremely fatigued, gain weight, possible pushing into other metabolic diseases. An infertility patient came to us and her Hashimoto disease was a hurddle for her infertility. Though she took thyroid meds, she was gaining 1 lb a month even with rigorous excersise and low calorie diet. Her antibody level was close to 400, which is more than 130 time higher than normal. We treated her infertility, but couldn't skip minor treatment for Hashimoto conditions. After 4 month with us, she stopped gaining weight. The next month, she found her antibody level dropped into half. Although the previous antibody level was checked up 13 month ago, she's clearly sure that the actual drop was after starting Heayoon's treatments, because her thyroid related symptoms were all getting worse before. After 12 visits, she finally got pregnant! Autoimmune diseases are quite broad range and the disease profiles are all different along organs attacked. Heayoon's treatment can calm immune system down by regulating nervous system balance and you can actually track the immune cell composition changes from treatments. Depending on the organs and tissues damaged, various amount of functions can be recovered, too. A 69 years old patient came to us to relief his spine & hip pain. He had 18 years history of spinal pain and functional loss from Cauda Equinal Syndrome after the lumbar spine collapsed. His urinary bladder / large intestine lost functions and he needed catheter to empty UB, and enemas / laxatives for bowel movement. His legs were significantly atrophied and he walked with full canes on both sides. After 3 weeks of acupuncture treatment of Heayoon, he recovered good sensation on skin & deep muscles of legs. His urginess for bowel movement came back and the amount and frequency of enema/laxatives got drastically decreased. He can move his toes, which showed no motion at all before treatments. His dorsiflex on ankles came so strong as well. He safely could completely stop narcotic painkillers meantime, which had been his biggest wishes. We prescribed the very first herbal formula on 3rd week. Next week, he came back with full excitement. His improvement got accelerated even further, and reported one step jump in all the functions! He completely stopped enema/laxatives, bigger dorsiflex of ankles leading to more natural gait, very stable skin/muscle sensation. He told us he could practice single cane walk for 2 hours. His progress isn't impossible with you. Please arrange a free consultation session with Heayoon and search for further hope to recover your essential functions in your life! The current medical society believes Type I DM is a genetic problem, and once a patient got all the beta islet cells killed by his own immune system, nothing they can do to improve the condition. Our patient with 20 years of Type I DM history came to us to treat wrestless leg syndrome. He got a great improvement on the very first visit, but had 3 more maintenance treatments. After 3 weeks from the 1st visit, he got astonishing changes. His A1C level went down by 0.6! Lower blood pressure as well. He said his A1C never changed through his life, this sudden drop of A1C is definitely from Heayoon Park's treatment, and stabilization of blood sugar level in the past month was actually significant. We argue that human body is well equipped with fine control system and this system is embeded into DNA altogether with disease genes. It is our life style and stress level that trigger those recovery genes or disease genes. There is no possible way to prove the efficacy & side effect of Heayoon's treatment for type I DM through double blind comparative study, no way. However, Heayoon's treatment can recover organ balances of you and trigger your body to improve blood sugar control even if beta cells are gone. Even further, researchers found fully grown adult mice might be able to generate insulin again after total destroy on beta cells, and it's published in the Nature*. Why do you limit yourself to the maniac worship of genes in this current world, then? Just give a try and see if there is any hope in your Type I DM condition. *Nature. 2010 Apr 22;464(7292):1149-54. Epub 2010 Apr 4. Conversion of adult pancreatic alpha-cells to beta-cells after extreme beta-cell loss. Evidence based medicine-EBM? Does it really help you? EBM can be another weapon to you charging daunting amount of money for blood works and medical imaging as just diagnosing tools without proper supports as solutions. A few acupuncture points and herbal formula "properly applied" to you may give more reliable understanding what's going on in you without risking you into another heart attack from the daunting 4 digit $ amount of cost. Just give a call for free consultation. After getting prostate cancer surgically removed, the patient lost urine control. Even after 2 years, he needed to change pads 4 times a day. With 1 month treatment by Heayoon, he could stay all day long with only once or rarely twice! Sorry, his evaluation signature is so obvious name of him. We can't post it. In Oriental medicine, any pain from whatsoever origins is same. If you judge a good practitioner only based on how much reliable results immediately he/she generates, nothinng else, you can experience something quite hard to imagin. Gout pain is very stubborn and difficult to remove. During this 1st treatment for gout pain, the patient started response with sudden tingling and changing the skin color on affected area. The patient left the clinic with a full smile after a series of chages from one sensation to another, eventually exactly same feeling with other healthy toes. She went back her long time wish-1hr walk a day-after the 2nd treatment. The patient got this pain from the surgical removal of a toe bone. The patient got multiple strand of neck muscles removed to lose tension balances between left and right neck muscle groups. Overworking incurred the pain of this patient's. Right quadracept and IT band showed obvious atrophy and pain from his herniated disc surgery a few decades ago. The patient couldn't even imagine to take taylor's leg posture before the treatment. After the frozen shoulder flared up apprx. 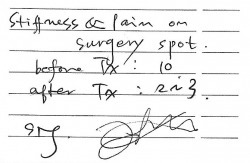 10 year ago, the patient got the chronic pain on the shoulder. Pain is most convenient parameter to prove an immediate action of Heayoon's acupuncture. That's why you see pain patients only in this page. Reactions involving tissue changes, i.e. more flexibility, reduced edema, or removed bruise follow afterwards. Internal conditions like insomnia, dysmenorrhea, or cysts are less appropriate to show "immediate" effect of acupuncture, but with reasonable time frame, you can feel the difference based on different parameters more proper to each condition i.e. size of cysts.